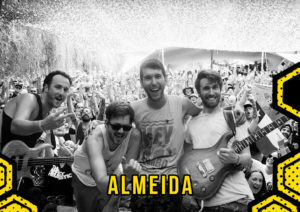 ALMEIDA grew up together on the UK south coast with a shared passion for outlandish music. Since forming in 2007, Almeida have played in over 20 countries, turning heads with a unique brand of intricate progressive metal combined with the frenetic pace of 90's skate punk. Latest EP 'Social Media Circus' was released in 2015 on Lockjaw (UK) and Bird Attack Records (US). The band are currently writing a follow-up.